It’s been a busy week for gun legislation in Wyoming. Because of the loud support from gun owners like you, Representative Bo Biteman’s “Campus Carry” bill — HB136 — passed out of the Wyoming House by a vote of 40-19 with no weakening amendments! Unfortunately, there’s a bit of foul play going on. Representative Eklund’s Trojan Horse bill — HB194 — also passed, and the two “Campus Carry” bills will now dual it out in the Wyoming senate. Truth be told, Eklund’s bill isn’t really a “Campus Carry” bill at all. To go even further, this bill also mandates that the name of anyone who carries on campus is to be published, like a common criminal, and given to parents, students, and local law enforcement. It’s a de facto gun registry, and is clearly designed as a bait and switch bill aimed to gut Biteman’s real “Campus Carry” bill. Your Senator needs to hear from you on this, more on how to contact them in a moment. At the same time, Representative Biteman’s “Repeal Gun Free Zones” HB137, also passed out of the Wyoming House 47-13. Last week we warned you about potential “poison pill” amendments that are used to water down good gun bills in Cheyenne. As soon as we advance meaningful gun legislation, they gut the bill by adding language that would render the true intent null and void. It looks like this year is no different. We knew, as soon as the “Repeal Gun Free Zones” bill — HB137 — started to gain momentum, that the backroom deals would start happening behind the scenes. It turns out, we were right. HB137 — Biteman’s “Repeal Gun Free Zones” bill — got the good ol’ poison pill. Seeing as how we’re already a Constitutional Carry state, this amendment, if left in the bill, would basically cut the value of this legislation in half. Ending “Gun Free Zones” means we should be able to protect our families everywhere, without needing permission. The House draft of HB137 (including the poison pill amendment) is now heading to the Senate. That’s why the Senate needs to hold the line on the Second Amendment and push the good bills without any weakening amendments. The media is blasting Biteman’s “Campus Carry” and “Repeal Gun Free Zones” bills while concluding that they will inevitably die in the Senate, as it’s known to be the “more moderate” of the two chambers. We can’t let them pass these bills in this condition. They must hear from us. They’re getting pressured from gun-grabbing billionaires and their front groups to keep these poison pills intact, effectively doing nothing for gun owners. But we all know Bloomberg and his cronies have one weakness. They live thousands of miles away. We live right here in Wyoming and we all know nothing gets a politician’s attention faster than phone calls and messages from their district! 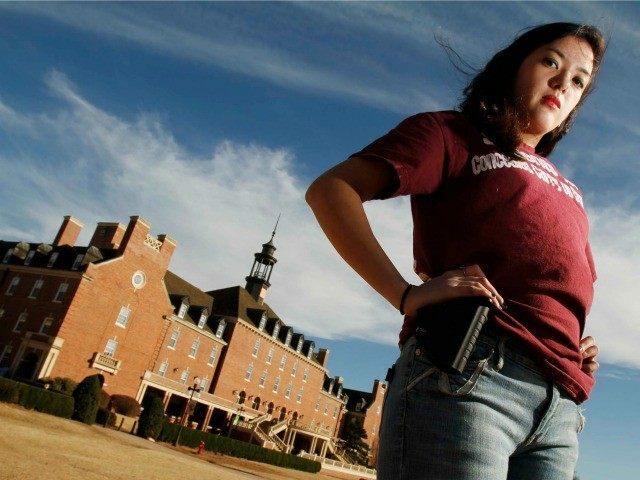 >>> Support Biteman’s “Campus Carry” and “Repeal Gun Free Zones” bills –- HB136 and HB137 — with no weakening amendments. >>> Oppose Eklund’s bad “Campus Carry” bill — HB194 — in it’s current form. Not sure who your Senator is? — click here to find out. Or you can call the switchboard at(866)-996-8683 and they’ll connect you automatically based on your address. You can also email your Senator, a list of their emails can be seen here. Of course, most of them are on Facebook and can receive messages. So feel free to send them a message that way, too. Regardless of how you contact them, please just make sure you contact them as soon as possible. Leaving a message with their staff will only take 90 seconds. Once you’ve made your calls, please consider chipping in a donation to Wyoming Gun Owners of any amount. Whether you can give $250 or $500 as some have done, or if $50, $25 or $10 is more appropriate for you – please do what you can right away. WyGo is trying to mobilize as many gun owners as possible to push these bills through and your donation will help us do just that. We’ll keep you informed, please stand by for future updates! P.S. Multiple gun bills in Cheyenne have passed the House and are heading to the Senate! Unfortunately, Rep. Eklund’s “Trojan Horse” gun bill — HB194 — also passed and is heading to the Senate as well. HB194 would gut any meaningful “Campus Carry” legislation by creating 43 different standards of “Campus Carry” throughout the state — and require the name of people who carry on campus to be published! We need you to pick up the phone and call your Senator right now — and insist he support HB136 and HB137 with no weakening amendments, and oppose HB194!